The first really important thing you need to know about me is that I am descended from a goddess. Also... a couple of gods... some cool; some not so much. But they're still family. The unimpeachable evidence for such claims is all here in black and white (and occasionally in color) in the next two dozen or so web pages (complete with links to a whole mass of additional fortification of said views). This is the Mother of All Family Trees. For the doubter's initial edification, all of said evidence is summarized immediately below in the form of an "executive summary" (i.e. Figure 1). This particular graphic graphically covers about five to ten thousand years of human history, ancient history, a fair amount of herstory, and as luck would have it, a bit of revisionist history by various winners, zealots, and fanatics of any number of several stripes. What is particularly astounding in this current work of history -- more particularly in some cases, herstory -- is that it was not actually necessary for me to fabricate or speculate wildly in the construction of my family tree. While this might constitute a serious breech in traditional genealogy (as practiced down through the ages), it did lead to some rather amazing and astounding realizations. There was also the interesting side effect that I was able to discard many previously disseminated fantasies and fables, while simultaneously recognizing the occasional plagiarism of lives and events by others (so-called "literary license" in the ancient and modern worlds), and thus I (and obviously others) were able to clarify many outstanding issues. One of the truly amazing things about Figure 1 -- besides being for the most part factual and thus distinctly heretical in the eyes of an amazing number of so-called experts -- is that the span of human history has been encapsulated into an idraw document filling a single page. That's pretty much got to put human history in proper perspective. There is the added feature that this same span of human history can be presented to the unwary in the form of a single slide or overhead projector. This, of course, assumes that you're the kind of presenter in which communications or information transfer is either not intended or just a bit unlikely. "It's the view of the more thoughtful historians, particularly those who have spent time in the same bar as theoretical physicists, that the entirety of human history can be considered as a sort of blooper reel. All those wars, all those famines caused by malign stupidity, all that determined, mindless repetition of the same old errors, are in the great cosmic scheme of things only equivalent to Mr. Spock's ears falling off." Mr. Pratchett did not specify that said "entirety of human history" might someday be encapsulated in a single graphic... but it stands to reason that it was certainly on his mind... at one point or another. He might have also failed to note that, interestingly enough, I have a Ph.D. in theoretical physics... and thus confirming, possibly, his worst fears. But then again... maybe not. This particular Executive Summary begins, as they so often do, with references to the Mother Goddess... and not just any Mother Goddess, but the Mother Goddess of Them All... the Grand Dragon Lady going by the Sumerian name of Tiamat. Other names could of course be used... just pick your mythology and the relevant name used therein to describe the main mommy... the mommy who, if not happy, ensures that no one is happy. After all, the name of a goddess (or even a god) by any other name would still smell as sweet... and/or probably cause about as much trouble. The fact that any given god or goddess in any given tradition has an exact counterpart in most every other tradition, only goes to suggest that perhaps many of these so-called myths are in reality... history. History is, after all, most often written by the winners; whereas myths -- with their being notably more subtle and ever so slightly fantastical -- are written by those who cannot afford the luxury of directly challenging the winners (and their histories)... and are thus forced to perpetuate their own truths in a non-adversarial, non-threatening manner. The fact that many modern mythologists are able to describe a more accurate history of the world than the historians is simply a sign of the times... those lovely times when minority reports can actually find their way into the light of day... and/or lead to something approaching truth. But enough about gods and goddesses; let's talk about me. Not so much as in the form of an autobiography, but rather in the form of My Family Tree... which, by the way, is being brought to you at considerable time, effort, expense, and... due to a not insignificant amount of hubris. Now... it might be thought by the uninitiated that family trees, their development and the associated extensive research that goes into their construction, are generally considered to be nothing more than grist for the old saw mill, and frivolous efforts on behalf of those people (aka those “descendants”) who... well, to be blunt... have entirely too much time on their hands. In point of fact, many genealogists have not been filling their days wasting hours in the labor intensive process of figuring out just who begat who, ad infinitum. Nor have they spent an inordinate amount of time answering the over riding question of: Why in the world did she begat with him! 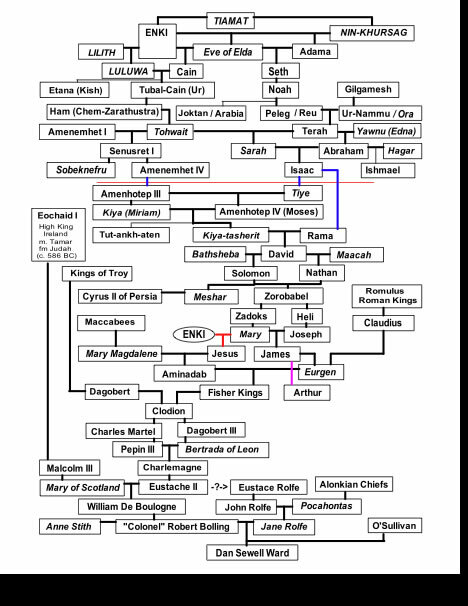 The latter question, is in fact, often blindingly obvious... at least in such Family Trees as Tiamat's... and as are the reasons why these same genealogists consider specific family trees to be really, really, really important. Like me, for example... what with my being descended from a goddess. The latter factoid, in true genealogical fashion, has been previously and undoubtedly established, proven beyond a shadow of a doubt, and given the no-nonsense moniker of Q.E.D. (“thus it is conclusively proven”). It's even been given the Goodly Housekeeping Seal of Approval. Accordingly, we will no longer entertain even the slightest of doubts concerning their efficacy. Besides I have slides to prove it. Many slides. All very complicated. However, for the benefit of the average reader -- who is typically either jealous or worried that their family tree might not be as grand as The Mother of All Family Trees -- there is the realization that discriminating readers might actually be able to apply their name to a branch, root, or fig leaf of this Mother of All Family Trees. And when one has seen the possibilities -- which will become apparent after a dozen or so web pages -- many open-minded readers may wish to find their own way through their own genealogical maze. Or they may run for the exits... who knows? There is also the added bit that some Family Trees (such as this one) can serve quite adequately as a focused history lesson. This particular course of study extends from ancient times (in the guise of archaeology, Egyptology, mythology, and various Ologies of the Fifth Kind) all the way to modern times (i.e., roughly today). Far be it to limit ourselves to the personalities and quirks of our dear departed relatives (and in some cases those hanging about at the time... literally and figuratively). It is also a good opportunity to delve into the intricacies of world events and how our families fared... and curiously enough, why. Even more relevant is the possibly very real distinction between said royalty and those who do not have such airs. Royals and Commoners are, allegedly (albeit well documented), distinctively different breeds of cats... some possibly not even reaching the heights of feline... anything. The differences could be thought of, for example, as a matter of “blue bloods” versus “red bloods.” And while some people may be eager to claim themselves as being a “red-blooded _____[fill in their nationality]_____”, the fact of the matter is that the blue bloods are inevitably the humans in charge. Blue bloods are the ones in power. Clearly, dem wid de gold makes de rules... and as luck would have it, dem wid de power have de gold. The bloody issue of royals... [just assume puns will predominate herein, and accordingly grant me pardon in the same expedient (if not financially lucrative) manner as typically involved on the very last day of a US president’s tenure] ... Now... where was I? Oh, yes. The bloodline issue may in fact have a very rational, real, or valid basis, and may even -- astoundingly enough -- actually be of paramount importance. If the blood of the royals... the sang royal (even the Sangreal)... is in fact distinctly different from the blood of lowly, common, Homo sapiens ordinaire... then perhaps, just perhaps, the bloodline of different families... as presented in living color by their family trees... might have some real world importance. In such a beneficent genetic circumstance, it stands to reason that said descendant would have godlike DNA (in greater or lesser proportions... even if possibly somewhat latent... to date at least). Therefore... we would likely have, or be entitled to possess... substantial royal powers, the kind that literally reign (or merely fog with mirrors) over those with less powerful DNA, blood, talents, and genetic inheritances. It should also be abundantly clear, or well established by anyone with a smattering of world experience, that it’s not what you know, but who you know... and a Great Goddess you can call mummy can be very, very important to your career path. Trust me on this one. Family trees rule! Furthermore, anyone with connections (to power, wealth, or family) are often able to wield their own form of power (inherited or otherwise). In the same spirit, those of lesser power are inevitably obligated to take into consideration the questions of who knows who, and whose kid is whose. Such lesser powers might accordingly be well advised to handle the mayor’s son with care, avoid antagonizing the daughter of a powerful senator, and ideally, not crucify the offspring of a god! A word to the wise. “Blood will tell” is a common phrase that, perhaps surprisingly enough, may prove to have a lot of meat in it (in fact, “red meat”... that is to say: blue blood, but red meat). It really is important what one’s genetic heritage is... and despite the powerful influence of environment on the evolution of the individual... the blood flowing in one’s veins -- or far more accurately, the DNA residing, cavorting, and doing its thing in one’s cells -- makes a world of difference. And if the genetics, epi-genetics, and morphogenetic fields of individuals do not impose their own inheritance sweepstakes, then the traditional bonds of ‘my kid is better than your kid’ will inevitably take precedence. What this all comes down to is that the study of family trees, their construction, and the time devoted to them simply cannot be casually dismissed. They are important... and in particular, they are supremely important to the Powers That Be... the latter being an inherited position far more often than not. These people in fact believe in the truism that "Blood with tell." That rather makes it so... or very nearly. And, if by the way, you disagree... they need only look at you and mutter, "Yes indeed... blood will tell." There are, admittedly, certain difficulties in generating an accurate, complete, and unassailable family tree. Clearly, the first order of business would be to demonstrate a DNA inheritance sequence, such that the blueness of the blood could thereby be documented. The fact a DNA strand occasionally goes astray (and the next supreme leader turns out to be as dumb as a fence post)... or that the natural vagaries of DNA transmission and duplication can be probabilistic at best... or that certain DNA combinations from common sources can result in important physical infirmities... all such problems may indeed yield some legitimate concerns. There have been DNA studies seeking to identify distinctive DNA markers associated with over-achievers in everything from science to athletics to music and dance to pathological lying. Obviously, explaining a family tree might be even easier. Such scientific research can indeed accomplish some very interesting feats... as well as sleights of hand... and thus has the potential to turn genealogy into a whole new... well... among other things, a can of worms. The Human Genome Project, for example, has already of necessity turned to the politically correct consideration of ethical concerns... i.e., how to avoid upsetting people with either very narrow views or a distinct void of any sense of adventure. Why not some niffy DNA enhancements, for example? The goods news (and in many cases, the bad news) is that DNA Genealogy puts to rest a lot of the problems associated with inaccurate, lost, or intentionally misleading documentation and/or records. But when the DNA samples are not available (due to any number of reasons, including cost), we must rely entirely on documentation to legitimize the various claims to specific bloodlines. This has always been the traditional way. The problem is one of believing the documentation, when the art of spin, revisionist history, and intentional misinformation has been handed down from generation to generation. Spin-control is not new, and in fact has always been pretty much standard fare in the halls of royalty. Commoners have also become quite adept at it as well. There is also the inevitability of a lot of hanky panky arising among real and official parents, so that such extracurricular activities could be(gat) a major problem. However, one should always bear in mind that when it comes to royal lines of descent, the individuals concerned were there at the scene at the relevant time, they knew who was who, to some degree who was fooling around with whom, and importantly, were very, very intent upon keeping the royal line intact, unblemished, and legitimate. There were rational reasons (at least, on the basis of bloodlines) for managing marriage combinations, ensuring virginity until the appropriate moment, and in distinguishing between legitimate and illegitimate offspring. The fact they did not always keep enough records, or in the event such records simply failed to survive the ravages of time, means very little when being compared to the actions and memories of the people who were living on the front lines in the succession sweepstakes. They were there. They are the best judge of what happened, even if they wrote something different. It's that simple. The attempts to construct a viable family tree can be challenging to anyone. But for royalty, i.e., the blue bloods, the constructions must also reflect, as nearly as possible, the true state of ... affairs. Fathers, for example, have a very strong tendency to prefer (and/or demand) natural sons to adopted sons. The extent of an overriding insistence upon an unassailable royal line can be seen by the example from a mere few hundred years ago, when the highest ranking aristocrats of the land were always in the room when a queen gave birth... just to ensure that the birth was a live one, and furthermore, to determine the gender of the newly born child. Clearly, this was done to ensure that there was not a last minute substitution of a less-than-royal-blooded child, or in order to claim a new heir to the throne... which from an historical perspective was a very well practiced art. How do you think Moses made in through the bulrushes? (Okay... Admittedly some of the aristocrats were just perverts who wanted to see a queen sweat, push, and swear.) Nevertheless, for aristocrats and royals, throughout millennia of history, the methodical tracing and managing of the bloodline was enormously important. Anything but the bluest blue blood was simply unacceptable. Tangerine blooded individuals need not apply. The critical question is: Why is there this extreme fascination with a bloodline... other than perhaps to avoid the chaos and confusion resulting from conflicts and wars arising from the choosing of the next royal and/or aristocratic successions? The very act of one choosing which god one might claim as a family member -- with some of said choices being shown to be extraordinarily unwise -- does not necessarily mean that this god is the particular god from whom one is descended. It is indeed possible to treat someone as a father, when the genetics are simply not there. There is also the possibility that two genetic grandfathers might be treated quite differently, and for some very rational reasons. Dan Brown’s The daVinci Code, in an admittedly fictional account of the trials and tribulations of just such a succession of the royal, Sangreal bloodline of the Desposyni (essentially “of the Master”, i.e. Jesus Christ’s family and heirs). It is also the story of the hierarchy of the Roman Catholic church’s two thousand year attempt to interrupt the royal, messianic bloodline and in doing so, garner secular power exclusively for themselves. Brown’s novel, while fictional, nevertheless does have an underlying theme that is based strongly on documented history and tends to be far closer to reality than most works of so-called, fact-based non-fiction. At the same time, the novel shows the intensity and demands of people who are very, very, very interested in keeping the bloodline intact. Or in the case of the Church, of ending it. Severing it. Burning it. Guillotining it. Bludgeoning it... Whatever. You get the gist. Now... I fully appreciate that you may not agree with such a state of affairs. But... if the Powers That Be agree with it... then what exactly are your options? We should also, as a matter of course, address the possible concern with dilution in the royal-bloodline-rules-all scenario. If we, for example, start with Tiamat, Goddess of the Sea, Goddess of Chaos and the Primordial (aka, supreme Dragon Lady) -- which in fact we will be doing shortly -- then a valid question would be: Just how much of the royal blue blood of Tiamat will there still be extant in any individual after roughly 160 generations? What are the chances, in point of fact, of their being a single molecule of the Tiamat variety in a modern day human... and therefore what are the chances of goddess like (and/or godlike) characteristics being in the DNA of that same modern human who is, on the basis of genetics, claiming a divine right to rule? Curiously, the odds (of having said divine characteristics following 160 generations of dilution) are really pretty good. We know, for example, from studies of homeopathy, that careful dilution (including the 50-50 kind) -- and one must assume that in all of the intervening generations, all of our ancestors and/or participants were being very careful in their sexual encounters / dilutions -- careful dilution achieves astounding results. Specifically, the dilution of a solution that has, for example, the property to kill a pesky bug, will after a great deal of fifty-fifty dilutions (say 160 such dilutions), result in a solution that will not only still have the property of being able to kill that same pesky bug (or one of the bug’s bloodline descendants), but will, in addition, do so without the normal, negative side effects that often accompany the solution when it is administered. Many moons ago, my eldest daughter, Shari, became interested in genealogy and her various family trees (which as it happens included twice as many trees as mine). She was able to do so, despite the time constraints of two small children (descendants) running about her home, and her (not her children) working a nearly full time job with Disneyworld. She had first delved into her mother’s side of the family... which, of course, in my opinion, was boring! ...despite some interesting links to a few historical figures of note. Then she took on my branch of the family. My reaction was basically: “Cool.” That was until she informed me one day that she had traced my lineage back to the legendary Pocahontas! Now this had some meat on it! My wife, as it turns out, was descended from ancestors who arrived in America aboard the Mayflower. Big friggin’ deal! Right? Now... however... suddenly... instead of listening to the pride of someone with ancestors who were among the first to arrive in the “New World”, I was now able to point out that my ancestors had been here to meet their boat when it dropped anchor! Suddenly, one of the enormous advantages of having an impressive family tree -- i.e., being able to lord it over others -- was astoundingly apparent. Then... Shari outdid herself and shortly thereafter was able to trace our lineage -- via my paternal grandmother (and via Pocahontas’ husband, John Rolfe) -- all the way back to King Louis IV of France (AD 936-954)! The idea of being descended from the French was, admittedly... a bit daunting... but then again, being from French Royalty... well... that, one could perhaps tolerate. But it gets much better. As it turns out, I was already aware of Laurence Gardner’s extensive research, in such books as Bloodline of the Holy Grail, The Magdelene Legacy, and Genesis of the Grail Kings. Consequently, I immediately realized that by using my daughter's work as a springboard, I could now trace my inheritance back to... well... Tiamat herself! Figure 1 is, in fact, the result of such efforts. In addition, of course, there was the distinct possibility of finding myself on the receiving end of the DNA/blood/lifeline of... ready...? In any case, it was now time for some serious bragging rights... in fact, bragging rights in extremis! Terry Pratchett, The Last Continent, Harper paperback, 2008, page 267. Part of the lyrics to "All About Ruprecht", from the musical, Dirty Rotten Scoundrels.